Having topped their group in round 1. 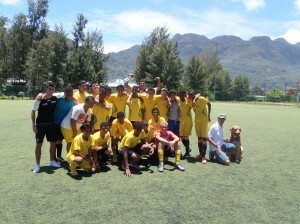 ISS Under 15 Squad had mixed fortunes in the second round group stage of the Vijay Tournament at Stad Linite on Saturday. In Match 1 ISS ran out 2-1 winners over a strong English River outfit who had already beaten Belonie 2-0. All three sides were awarded 3-0 victories over ‘no shows’ Beau Vallon. In the ISS second match against Belonie a blatant error by a referee’s assistant disallowed a well worked goal finished sweetly by Captain Abdul Haq who had previously netted from the spot against English River. ISS unfortunately conceded from two set pieces and unfortunately eventually lost 3-1 despite an inimitable Haq solo effort which involved a fabulous turn and near post finish. Yohan Raoul worked tirelessly in midfield in both games and debut goalkeeper Hakeem Mothe also deserves credit. Hopefully some hard work on the training ground will see some improvement and tightening up of set pieces for future competitive games.